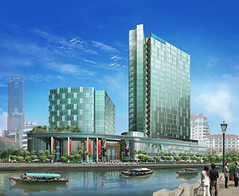 Central is an upcoming landmark development located above the Clarke Quay MRT station within the Central Business District. Pioneering a new live, work, play concept, SOHO at Central, comprising two towers with a total of 227 Small Office Home Office units, has captured the imagination of the Singapore and regional markets. Ninety per cent of the 115 units released have been sold ahead of an official launch campaign in Singapore. The development’s popularity can be attributed to its much sought-after combination of compact spaces in a high-class development with excellent transportation connectivity. It also has the added attraction of a scenic location by the historic Singapore River. SOHO at Central with most of its units in the 635 sq ft size range, offers a very attractive investment option for investors and owner-occupiers alike. About half of the buyers are investors, the rest are business occupiers in professional fields. Over 50 per cent of the buyers are foreigners from China, Hong Kong, Indonesia, Japan, Malaysia and Taiwan, the balance are Singaporeans. SOHO at Central presents the only purpose-built home offices in Singapore. The development offers a prestigious business address with full flexibility in commercial usage. Each unit comes with quality home finishes, fully-fitted bathroom and a compact kitchenette. Owners can use the units for the dual functions of office and residential living or for the exclusive use of either purpose without the need for additional approvals from the authorities. Each unit’s innovative workspace can be turned into cosy living spaces instantly. The high four-and-a-half metre floor-to-floor height coupled with column free space give 40 per cent more volume compared with that of a similarly sized typical office unit. Owners have full flexibility to maximise this voluminous usable space through the use of creative interior design ideas and layout planning. Central is the first development in Singapore to integrate the diverse functions of real estate – habitation, lifestyle, business, community and transportation connectivity – within one complex. Designed for a population of 10,000 occupants, it will have two towers of SOHO units, a 25-storey office tower, a retail podium with riverfront F&B outlets, a sky garden and recreational facilities, full public amenities and a community hub. The epicentre of a thriving community, Central is surrounded by an educational enclave comprising the new city campuses of Singapore Management University, LaSalle–SIA College of the Arts, and other private educational institutions in the Selegie and Bras Basah areas. An estimated 40,000 students and teaching academia, including 10,000 foreign students whom Singapore expects to attract, will study and work in the vicinity of Central. About one kilometre away are major banking institutions in the Central Business District with a working population of 50,000. Along the Singapore River, there will be 25,000 residents living inupmarket homes. Currently, this area is popular with expatriates from Indonesia and Japan. Central is seamlessly connected to historic Chinatown, the civic district, the arts and cultural district made up of museums, galleries and the Esplanade, as well as the entertainment belt of Clarke Quay, Boat Quay, Mohammad Sultan Road and The Fullerton Singapore. When completed, Central is set to invigorate the landmark Singapore River by infusing a new vibrancy into the area treasured for its rich historical background and architectural and business heritage. It is a key node that will contribute to making Singapore’s city centre more distinctive and memorable. Contact us at [email protected] or +65 9631 8037 for more information.